Conference by Eric Laurent at Barnard College NY. JACQUES LACAN DIED IN SEPTEMBER 1981. In commemoration, a three-day Seminar will take place from September 30th to October 2, 2011, at Barnard College, in New York City. The Seminar will focus on theoretical appraisal of Lacanian concepts and also on their ethical and practical bearings on issues that are crucial for our civilization, such as the decline of the Father, changes in the modern family, shifts in femininity, subjectivity beyond the Oedipus complex, LGBT issues, the relationship between Psychoanalysis and Science, (neuroscience in particular), and more. This Seminar will be hosted and sponsored by Barnard College, and presented under the auspices of the WAP – World Association of Psychoanalysis and Paris VIII University. It will be placed under the direction of Jacques-Alain Miller. Information about registration, call for papers and venue will come soon. Committee: Prof. Marie-Hélène Brousse (Université Paris 8), Prof. Pierre-Gilles Gueguen (Université Paris 8), Prof. Maire Jaanus (Barnard College), Prof. Ellie Ragland (University of Missouri), Josefina Ayerza (editor of Lacanian Ink), Dr. Eric Laurent. Josefina, how and where do we sign up for the Barnard conference in the Fall? Yes Josefina. Registration will be made through a website which is presently under construction But should be available soon. I reside in Vancouver, B.C., Canada. I and other friends want to attend the Conferense and Seminar. So, we’d like to have more details about registration fees, programme, venues, etcetera; in order to plan our trip well ahead. I was wondering where at Barnard College both Eric Laurent’s Thursday conference and the seminars would be held. If someone could clarify this for me, it would be appreciated. Thanks. 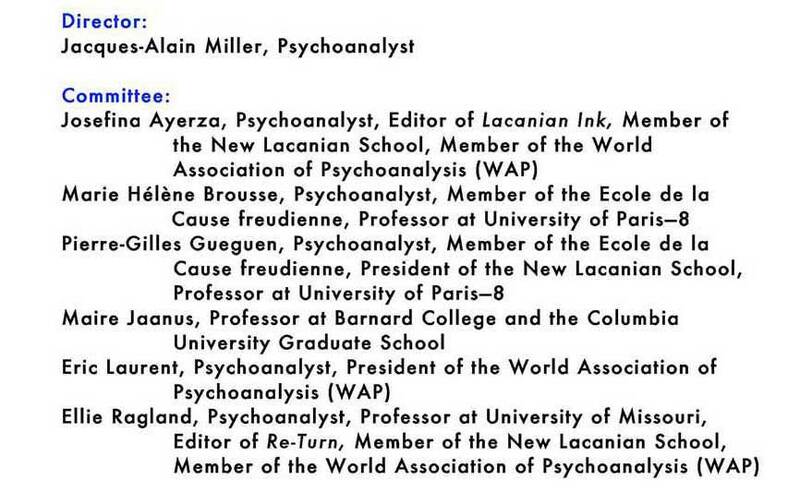 I wish to register for the Paris-USA Lacan Seminar at Barnard College September 30 2011. Could you kindly advise me of registration details.